With unrivalled and patent pending 24V-240V AC or DC multi-voltage range with automatic voltage sensing, multi-colour LED light for continuous visual actuator status feedback to the user, and its ability to change its operational function with user-friendly plug and play conversion kits to create failsafe and/ or modulating actuators from stock, it’s hard to think of a rival. All this in a plastic, industrial weatherproof housing. Conventional aluminium electric actuators tend to be significantly heavier than the light weight J+J, and it is not uncommon to see the extra cost added to installations where an extra support is required under each motorised plastic valve to support stop the pipework flexing. These heavy aluminium actuators can also restrict the design of pipe runs as the valves often need to remain horizontal otherwise the weight of the actuator can shear the fixing points to the valve unless more, costly supports are added simply to carry the weight of the actuator. No extra supports are usually required when pairing plastic valves with the lightweight, plastic housed J+J actuator. Mounting valve actuators to plastic valves can be difficult, but as covered in Issue 43 of the Valve User magazine, J+J have developed and produce a variety of mounting kits to overcome these problems, including the highly popular EasyFit kits to enable the J+J actuator to be mounted to the FIP VKD and TKD, GF546 or the Asahi Type 21 ball valves. Gaining in popularity is the Hidroten 3 way PVC ball valve, also designed and manufactured in the EU making the whole assembly of EU origin, because it is the only 3 way valve with side outlet readily available up to 3″/D90. 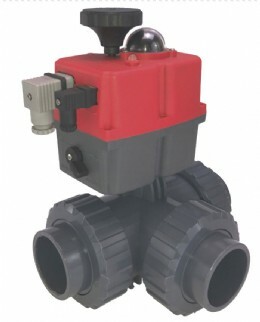 Available from 1″ with both L port balls for diverting applications and T port balls for mixing/ diverting, these three way ball valves have an integrally moulded ISO5211 actuator mounting platform allowing either the J+J electric (or its pneumatic counterpart the CH-air) to direct mount. So, if you are looking for actuated 2 way or 3 way plastic valves, consider the J+J electric actuator, the perfect partner for plastic ball valves.